The Terrascience Acquisition Recorder (TAR) is a 12,14, 16 or 24-bit digital data recording system is based upon the Terrascience Systems’ MicroRad series of microseismic systems. This equipment builds upon the experience gained in the design and deployment of Terrascience Systems’ structural monitoring equipment for oil and gas platforms and marine vessels over the last 25 years. The TAR software is designed to perform multiple tasks in parallel with acquiring data being the basic task. The TAR software processes incoming data looking for events, stores data to a circular buffer, generates complete statistics, transfers data to a remote database, and shows data in a graphical real-time viewer. Event detection, after data acquisition, is the secondary task of the TAR software. This is done by processing the incoming data stream looking for a short term average (STA) versus a long term average (LTA) ratio that rises above a defined value. When the STA/LTA ratio is greater than the triggering level for a defined number of samples in a defined window, an event file will be created and stored to disk. 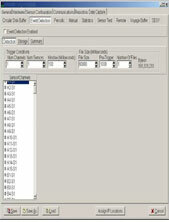 The event file will contain all data as defined by the pretrigger length and the event file size. Event Detection allows pre-filtering and definition of a window size in which all conditions must be met for an event trigger to occur.